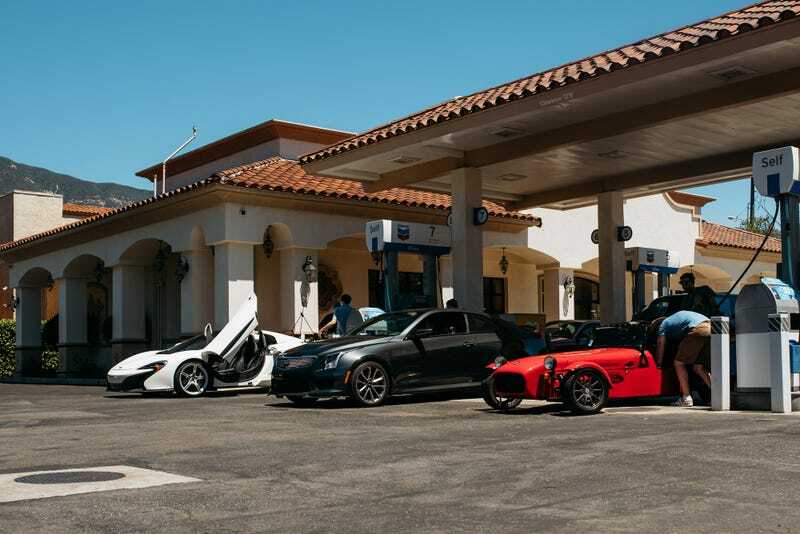 There’s the photo of us getting gas in Ojai yesterday while making our trek to Pebble Beach. We freaked out a ton of kids and onlookers with our collection of amazing (borrowed cars). If you live between Carmel and anywhere else, just walk out and look at the roads. Our trip started in Los Angeles, wound its way through the Mullholland Drive and up through the mountains and over to the Peninsula. Our car collection was fairly choice. The Cadillac ATS-V not only looks beautiful in that greenish-grey Cadillac color, it’s also one of the most comfortable cars we have. The Mazda wasn’t with us, surprisingly. But Road & Track’s Travis Okulski managed to borrow a Caterham, because Miatas are apparently too luxurious. You put gas in the back. It’s funny. He also made Bob Sorakanich drive a Miata, just in case. You always need a Miata. Alex Roy lent us a hat! Travis looks like the happiest retired hammock salesman in the world. More on what it’s like to drive a Citroen SM in the future, but Alex Roy was a hero. I took the McLaren 650S because I’m the boss. Damn this car is fun. Also, if you’re going to be in the middle of the desert I highly recommend an RV. This Class B from Roadtrek is like an office on wheels... with GPS. And maybe some beer (for the passengers).